NUR-SULTAN – The Kazakh National Guard will be shooting a film and TV series about the heroism of fallen Kazakh soldiers in the 1995 battle at the Tajik-Afghan border while protecting the Commonwealth of Independent States’ (CIS) external borders, said National Guard Deputy Commander-in-Chief and Major General Mukhometkali Satov at the April 6 wreath laying ceremony in the capital. The ceremony was held near the Defenders of the Fatherland monument. Veterans of local and international conflicts, National Guard and Border Guard Service officers and military personnel and students from school No. 25’s cadet class attended the event. 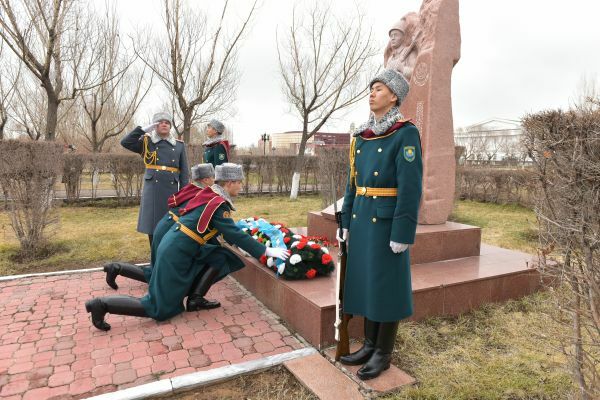 “The National Guard of Kazakhstan declared April 7 as the Day of Courage. On that day exactly 24 years ago, in the Pshihavr mountain gorge in Tajikistan, an unequal battle ensued with superior gangs from the adjacent side. The battle lasted more than four hours and took 17 young lives of Kazakh soldiers. Many were injured. In spite of the losses, the seventh company of the Internal Troops honourably fulfilled its military duty and remained faithful to the military oath, without dropping honour and dignity,” reported the National Guard’s website. Satov noted all regions of the country, National Guard personnel, veterans, fellow soldiers, friends and comrades honour the heroes’ memory. “Many wonder what the need was to send our children to the Tajik-Afghan border. Our people never forget their friends, especially since they [the soldiers] went there at the request of the leadership of Tajikistan. You know that Kazakhs never leave their close neighbours and comrades in distress. It is terrible to imagine what would have happened if the Mujahideen had seized power in certain regions. In Dushanbe, in honour of perpetuating the memory of the fallen soldiers, a monument was built. This is a sign of serious recognition,” he said. First President of Kazakhstan Nursultan Nazarbayev awarded five soldiers posthumously with the II degree Aibyn (Virtue) Order and 12 with Zhauyngerlik erlіgі ushіn (For military heroism) medals for the courage and dedication shown during their military duty protecting the CIS borders. The feature film and 10-part television series will recall the fallen soldiers’ courage and heroism. “Along with the Kazakhstan TV channel and the AU Cinema film company with the support of the Ministry of Information and Social Development, we plan to shoot a 10-part television series and a feature film about those tragic events in the summer of this year. I think this project will serve as a good example in educating the future generation in the spirit of Kazakhstan’s patriotism,” said Satov. Last year, the National Guard, Khabar TV channel and AU Cinema produced the feature film “Shestoi post” (The Sixth Post), which was shown across the country. Based on real events, the movie was among the top best domestic films of the year.